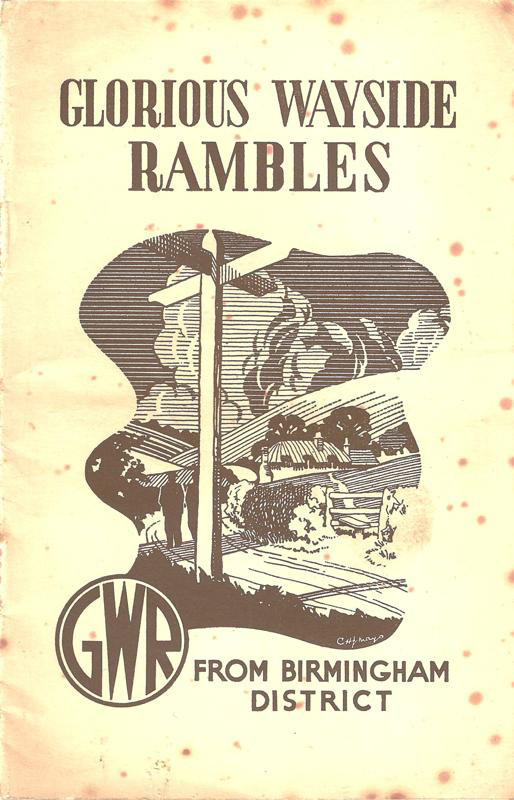 In 1938 the Great Western Railway issued a twelve page pamphlet containing a series of forty rambles between stations in the Birmingham Division. The walks varied between 3.5 to 18 miles in length, but with each walk description condensed to the bare minimum, when compared to the detail in the Rambles in Shakespeareland and the Cotswolds book. Cheap third class walking tour tickets were available to allow ramblers to travel to one station and return from another on the same day. The prices of these walking tour tickets from Handsworth, Hockley, Birmingham Snow Hill, Birmingham Moor Street, Bordesley, Small Heath & Sparkbrook, and Tyseley were included, as were walking tour ticket prices for the journeys associated with a further twenty-one rambles starting at Great Western Railway stations and returning via a LMS station. The cost of a third class walking tour ticket from Birmingham Snow Hill to Knowle, returning the same day to New Street from Berkswell was 1 shilling 10 pence.